If you have an STL model file for your 3D printer, you have to verify the model before you can print it. Software programs and slicing tools for 3D printing see all 3D models, including solids, as a series of triangles that join to create a hollow mesh surface. The triangles in your model must not intersect other triangles; if they do, they create an invalid mesh that causes problems if you try to 3D-print the model. It’s a good idea to verify that your model export or download is a valid mesh. A valid mesh for 3D printing is one that has a complete surface, and it’s also called manifold or watertight. All STL 3D models for 3D printing are exported as a hollow shell, think of them like a balloon. The model, like a balloon, has both an outer and an inner surface (skin) defined by many connected triangles to form the surface, with nothing inside the skin. If you had a hole in the balloon or 3D model the structure would not be viable. A 3D model can have missing triangles that produces holes in the mesh surface and cause it to become invalid. Triangles of a model can also be accidentally flipped so sections of the inner and outer surfaces become reversed. One of the most common modeling and export errors occurs with triangles that are not joined as a surface, but intersect each other, causing great confusion when trying to process for 3D printing. Finally you also need to have the 3D model in the correct orientation for 3D printing, and check that its size is what you expect and require. Netfabb Basic works well for this sort of checking because it highlights problems with exclamation marks and shows the orientation onscreen, allowing you to repair, scale, and reorient the model as needed for export and 3D printing. 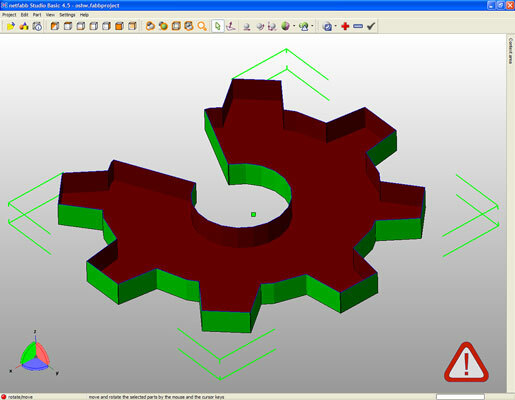 Netfabb highlights problems in your model with exclamation marks. When mesh errors are present, you can use Netfabb to make repairs. After rotating and scaling the model as needed, click the + button to attempt a repair. Then select Standard Repair and click Apply Repair to obtain a new model that you can export for 3D printing. Netfabb detected that this model isn’t solid. After repair, the solid model can be 3D-printed.